Are 3D Printers Basically Replicators? After hearing the news that NASA had "emailed" a wrench up to an astronaut on the ISS through its 3D printer, there was one word that kept coming up: Replicator. So, do we finally have a working replicator on our hands? "Oh my god, you realise what this means? The ISS has a goddamned replicator...", wrote thekeith82. And several other commenters agreed ("Replicator: a socket wrench. And a cup of Earl Grey tea." - MacShea), and not without reason. After all, just like the replicator, it's a machine capable of building a requested object on site, almost immediately. So is the 3D space printer a replicator? Well, not quite. For one thing, instead of a stored schematic, this one was produced by a team of engineers working on the ground on request and then emailed up to Wilmore. Even more importantly, unlike science fiction replicators, where objects are produced seemingly on demand and whole, this 3D printed version came out as a 20-piece assembly kit, that Astronaut Barry Wilmore then snapped together into a working socket wrench. But, while this may not be our replicator, what we do have is something almost as interesting —perhaps even more so. One of the questions that's been raised about a theoretical replicator is whether, and to what degree, customization would be both practical and possible. Certainly, there would be some degree of hacking that could and would take place. 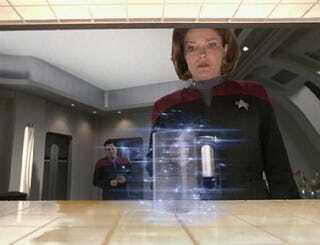 But just as likely is that objects ordered through some kind of replicator would become more and more standardized. Not unlike ordering a Big Mac at a MacDonald's window, the objects produced through a replicator could very likely be very, very similar to one another. With 3D printers, however, the ability to produce infinitely customizable kits — capable of being adjusted, swapped out, and continually altered — is already baked into the technology. It's certainly no replicator. But a future where we have to build and constantly adjust our own technology, instead of having it meet us fully formed just might be the future I'd prefer to live in.